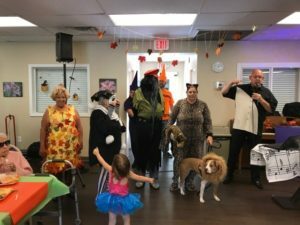 Near the end of October, the residents of Goodlette Arms, Full Circle Communities’ senior living facility in Naples, Florida, celebrated their annual Fall Fest. Joined by their friends and family, residents danced to Halloween-themed music while dressed in costumes that ranged from crayons to characters from The Wizard of Oz. Celebrations like Fall Fest are typical at Goodlette Arms – however, this one proved to be especially cathartic. Only one month before, Hurricane Irma decimated the Sunshine State. The storm, which is unofficially the fifth costliest on record, caused around $20 billion in damage to Florida, with Naples’ Collier County sustaining an estimated $320 million of the total. Evacuation was impossible for many living at Goodlette – about 80% were forced to sit out the storm. Joined by management and staff, including some who flew in from Chicago, residents watched from the lobby in awe as winds decimated the surrounding neighborhood and uprooted trees like they were playthings. A sense of normalcy has been slow to return. Just days after the storm’s dissipation, large drying equipment was brought in to mitigate interior damages, making once cozy homes feel cramped and nearly uninhabitable. Debris continues to line the sides of the driveway. Repairs and renovations have been slow to come, with insurance protocols impeding progress. Nevertheless, life at Goodlette continues to move forward. Residents have turned the lobby into an improvised community area while repairs continue. Scores of visitors, including high school students, members of the clergy, and law enforcement drop by to provide company and supply much-needed food and water. And, of course, celebrations like Fall Fest provide a much-needed sense of community and regularity. The hurricane may have nearly destroyed their home, but seeing the residents of Goodlette dressed in their costumes proves incontrovertibly that no force of nature, no matter how strong, is enough to destroy the spirit of their community. I don’t believe we currently have any openings, but I suggest you should call our management office at 847-849-5301 to double check.